Nothing is more taunting than a blank sheet when your brainstorming session is going nowhere. Factors like stress and lack of sleep can put a damper on our creative flow, and the longer you stare at blankness in front of you, the more overwhelmed you become at the prospect of thinking of nothing. Brainstorming sessions don’t always come up when you’re feeling your most inspired, which is why we all need tools for making them more productive. Here are 12 tips for kickstarting your creativity and discovering more innovative solutions to problems. 1. Come up with bad ideas first. People are apprehensive to share ideas in groups, especially when management or leadership is present. It can be intimidating, and everyone feels pressured to have the best idea. To loosen everyone up and set the tone that all ideas are welcome, start the session off with an exercise where you throw out as many bad ideas as you can. Not only will this set a more relaxed tone, but it will help get everyone’s creative juices flowing. 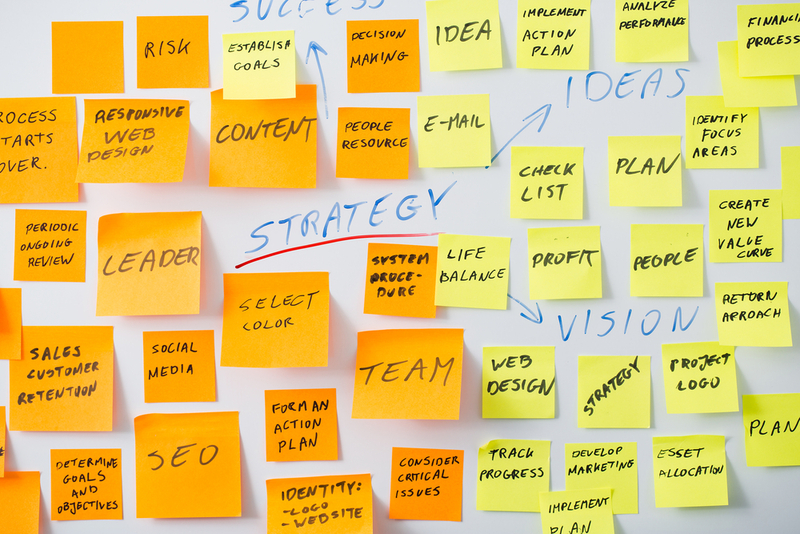 Whether you use post-it notes and a whiteboard or an online diagramming tool, lay out your ideas in a visual way to gain clarity on the bigger picture. Having a panoramic view of an issue can help you organize your thoughts, see new insights into your problem, and make connections you otherwise wouldn’t. Mind maps, mood boards, and flow charts are all great ways to begin mapping your ideas visually. 3. Solve the opposite problem. Sometimes when we can’t find a solution to something, we need to look at it from the opposite angle: try to cause the problem. Try an exercise where you come up with all the ways you can do the opposite of what you want. Looking for a way to create more sales leads via your blog? Come up with a list of every way you could hinder that process. When we understand our roadblocks more fully, we can create better strategies for preventing those things from happening. As Picasso famously said, “good artists copy; great artists steal.” He would never have painted some of his most famous works without ‘inspiration’ from African sculpturists. Chances are the problem you’re trying to solve has been dealt with by many before you. You should research how others met the same challenges. Rather than repeating others mistakes, learn from them, and discover your own new ones. Sometimes imagining a problem isn’t enough; we need to see it. Trying to solve a customer service issue? Have two team members act out a scenario together to see where issues arise. Problems you wouldn’t have thought of using only imagination are much more likely to come about as you’re trying to work through them in reality. One of the most common barriers to good ideas is thinking too broadly. Setting specific boundaries is much more effective when it comes to prompting creativity and innovation. Try a word association game called a “word storm.” Start with a broad term related to your topic of interest and have people take turns coming up with associated words. As you discover new related word and phrases, come up with associations for those, too. Eventually, you’ll have different combinations of related terms that provide for you a much more specific creative idea. 7. Take a break and do something else. Studies show that when we step away from a problem and do something else, our brains continue to think about the problem subconsciously. Ever wonder why so many of your best ideas come to you in the shower? Doodle, go for a walk or clean something. Find an immersive activity that gives your brain a break from directly thinking about the problem for awhile. 8. Try a SWOT analysis. SWOT charts aren’t just for vetting good ideas; they can also be used for turning bad ideas into better ones. A common mistake people make is assuming that good ideas always come in some sort of ‘eureka’ moments. In fact, most great ideas are made up of a lot of little ideas that evolved over time. Set up your SWOT chart (listing Strengths, Weaknesses, Opportunities, and Threats), and see how you can pivot your subject to better achieve your stated goals. Sometimes the one person who can’t solve your problem is you. It’s difficult for most people to imagine what it would be like to not know what they know, and consequently, we end up making a lot of false assumptions about our audience. Approach things from an outsiders perspective. How would a five-year-old approach this issue? What would someone from a different industry think of it? Sometimes just moving your brainstorming meeting from a conference room to the roof deck or outdoor seating area can stir ideas people otherwise wouldn’t associate inside. Studies have shown that being in nature is particularly useful for creativity. If your problem seemingly has no solution, you might not really understand the question. List out all the assumptions your project is based on. If you’re assuming that people won’t pay more for your service, challenge that idea by asking why. If you find an assumption that isn’t supported by data or is flat out wrong, it’s time to rework your premise. 12. Brainstorm alone, then come together, then alone again. Studies suggest individual brainstorming is more productive than group brainstorming. In fact, some people generate 2x more ideas when working alone than in groups. While group brainstorming is still an invaluable business tool, it doesn’t mean you can’t take advantage of solo brainstorming at the same time. Have your team members brainstorm before your group session. Share ideas and create new ones during your meeting, and then brainstorm again after. Most teams fail to do a final individual brainstorming session, but this is usually when the best ideas finally come to fruition. Think about it; if individual brainstorming is more productive than group brainstorming, then individual brainstorming after you’ve been inspired by a whole team of ideas is going to push your creative productivity to the next level. What’s your favorite exercise or tip for getting into a creative mindset?